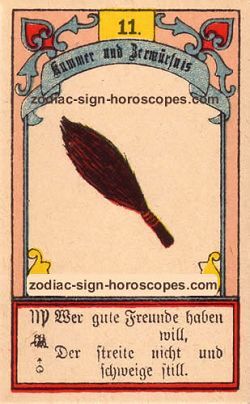 You have drawn drawn the whip as your daily Lenormand Tarot card for overmorrow, Tuesday, April 23rd. The whip is a negative card, so the day overmorrow will also have a negative tendency. It is the planet Lilith which will influence you overmorrow. Discussions can escalate overmorrow, with the wrong words you can hurt someone. Just restrain a little bit in discussions overmorrow, even if you are right, you can save yourself a lot of energy.